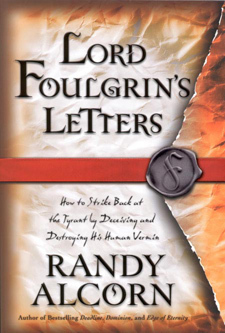 What Is the Difference Between the Revised Edition of Lord Foulgrin’s Letters and the Original? No need for you to get the new book. Actually, nothing much was added, it’s just 16,000 words shorter than the original—about 67,000 words instead of 83,000. I requested the change myself, after I edited the book for the audio version down to 60,000 words. I felt that all but about 7,000 words of the edit I had to do improved the book, making it flow better and smoother. So then I asked the publisher if I could just add those 7,000 words back to the audio edit and make this the new revised version of the physical book. Nearly all the 16,000 words cut were in the letters. It was my feeling that the letters were too long, particularly since I used such short scenes. The reason this happened goes back to the fact that originally I was patterning the book after The Screwtape Letters, which was all letters. However, at the last minute—when I was already working on The Ishbane Conspiracy with my daughters, and we’d decided to use both scenes and letters in that spin-off—I determined Foulgrin would be better if, unlike Screwtape, it actually had earthly scenes in it. So I added those short scenes. By then it was too late for me to change the letters much. But I wasn’t satisfied with the end product, feeling the scenes were disproportionately short and the letters long. By shortening the letters, the book is more balanced now, with a better proportion I think. I changed some other odds and ends in the revision (a book nearly always improves the more the author revises it—though it sometimes suffers when others revise it). I think it’s now better than the original, but I’ve also heard from many people who liked the original as it was. (I haven’t heard from anyone whose read and compared both versions.) But there’s no need for you to get the revision. If you ever get it for others, I’d recommend getting the new version, which is more reasonably priced also. The only down side of the new version is that while it looks nice, it isn’t quite as attractive. The pages don’t have the burned edge look, and it doesn’t have that two color effect that made the original pretty stunning, I thought. Okay, that’s the scoop. Save your money. Who knows, the old Foulgrin might become a collectors’ item.